Are you looking for cute novelty covers for upright vacuum cleaners? They make wonderful gifts for housewarming presents and holidays. Typically, a homeowner needs some nook or storage space to hide their cleaning equipment. However, with your creative gift, they could proudly display their vacuum cleaner anytime. Ever since motorized vacuum cleaners were invented in 1901 by Hubert Booth, millions of people have enjoyed the convenience of having one in the home. Unfortunately, this wonderful invention still needs a place for storage since it’s not exactly a pretty decorator item to look at. 1. Handmade Bunnies - Surely, your guests would find this adorable cover style a interesting surprise when they walk into the room. In fact, vacuum covers are great conversation starters. The cover with plaid hat and ribbons is super-cute. It's so adorable that kids would want to play with it. Suddenly, the uptight and upright vacuum cleaner becomes a imaginary friend that even toddlers want to hug. Where can you this style online? TryEtsy.com; the perfect place for pretty handmade products. 2. Grandma - The Grandma is a favorite among novelty covers for upright vacuum cleaners. Grandma tops the list as a cover for dressing your vacuum. Dressed in a long skirt with white apron, this novelty cover somehow brings a little down-home charm to any space. This is the style that I have for my vacuum cleaner and I really love it! You can find this cute cover on sale through Amazon.com below. 3. 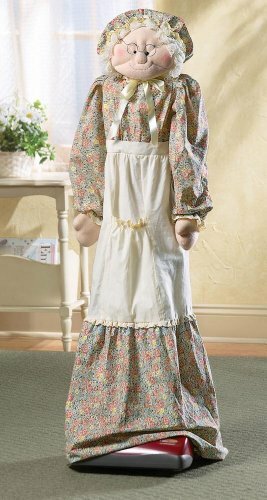 Country Angel- The Country Angel design is perfect for people who have country-style decor. Just place her in a corner to make sure she gets noticed. One benefit of dressing up your vacuum cleaner is saving space. No need to store them away especially if you frequently vacuum. At the same time, the novelty design can brighten up your home in a casual way. It can also work as a covering for a floor sweeper. See the Country Angel Vacuum Cleaner Cover by Collections E.t.c. 4. CoverDucky – The adorable CoverDucky can be found on Etsy too. There are other huggable designs like rabbits or teddy bears depending on your preference. The best part of animal-themed covers is that they work double-duty in other rooms like the playroom or family room. Who ever invented these products had a great idea, that's for sure. It's also an effortless way to decorate your home without buying items you don't really need. Interesting novelty covers for upright vacuum cleaners are not only practical, they are simply adorable. The Grandma Upright Vacuum Cover fits most upright models and measures 52 inches long. Her skirt slips right over the vacuum keeping it dust free and out in the open to save you closet space. What Do I Look Like? The Maid? When it comes to keeping things neat and tidy around the house, nothing represents housekeeping chores like this cute maid. Her pink cheeks look like she has been busy working and her poor broom is a mess. 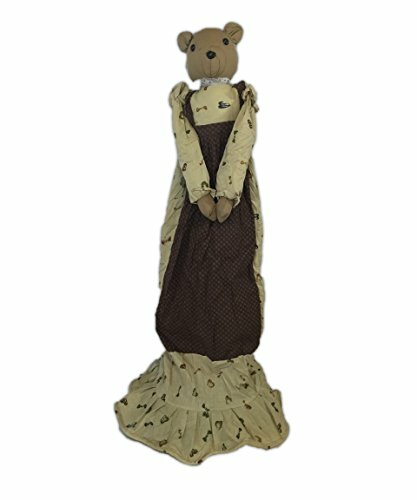 The brown and tan colors in Mama Bear's country-style dress work well with rustic decor or country furniture designs. She would look adorable hidden among a stuffed animal collection or leaning against an old pine cupboard. There are cute patterns available for the home sewer who wants to create her own look. If you have the know-how and creativity, I imagine you could choose your own head and specialty fabric. You could make one from denim, satin, or anything that matches your decor. Personally, I think it's easier to buy one because the inside portion of the head area has a special design that is reinforced with cardboard for support. Hopefully, manufacturers will create more to choose from sometime in the near future.